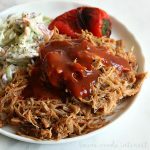 Make BBQ pulled pork in half the time with this easy Pressure Cooker Pulled Pork recipe. Cut pork shoulder in half so you have two 1 pound pieces. Lock the lid in place and turn the valve to SEALING. Set to HIGH pressure for 1 hour. When the timer goes off let the pressure cooker do a natural release for 20 minutes. Then turn valve to VENTING and release any remaining pressure before removing the lid. Note: Nutritional information will vary based on the BBQ sauce you choose to use.